What's that strange circular shape, you ask? That, friends, is what particle physics looks like when it's getting back on track. 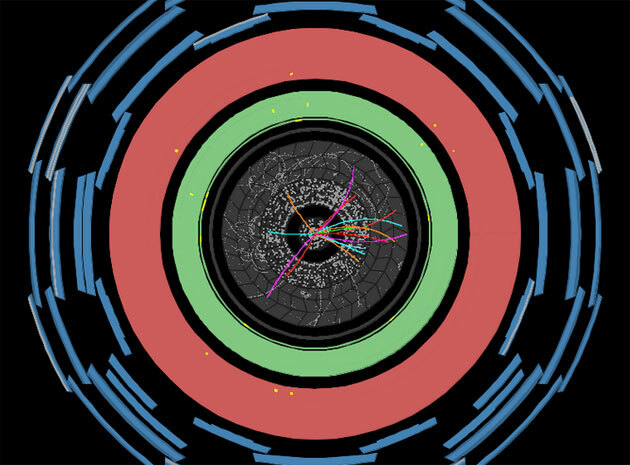 After weeks of test runs following its return to service, the Large Hadron Collider has resumed smashing particles together for the sake of real, honest-to-goodness science experiments -- those criss-crossing lines in the image above are a few of the early collisions. And this time, there's much more energy involved. The LHC is now colliding particles at a level of 13 trillion electron volts, or nearly twice as much energy as it used before its two-year downtime. The boost will hopefully lead to physics discoveries that weren't possible in the previous go-round, which is saying something when some past results were enough to earn a Nobel prize.